If you have really high performing posts from years ago, why let that engagement go? The Facebook newsfeed algorithm is heavily weighted towards engagement right now. So, if you have posts where people have engaged at a high rate, the algorithm reads that as a piece of content that these people want to see in their newsfeed. That engagement data is still in the newsfeed algorithm, months, even years later. So, to bring a high performing post back from the dead, all you have to do is refresh it with a quick comment. Here's a simple example from my personal profile. This is a post I made in 2013. It had around 20 people commenting on it. Please note that NO ONE HAS SEEN THIS POST IN 4 YEARS. To bring it back from the dead, all I did was refresh it with this comment. And just like that, this post re-entered people's newsfeeds, and it has continued to get engagement and comments....4 years later. The algorithm is so weighted in favor of engagement, that this post actually showed up in some of the newsfeeds of people that I wasn't even friends with 4 years ago. Here is a notification that I got from Katie Allred liking this post. I didn't know Katie when I wrote this post 4 years ago. But since I refreshed it, the historical "engagement juice" was apparently enough to have it appear in her newsfeed as well. *Sidenote: Katie is one of the founders of the Church Communications Facebook Group. You should check it out if you aren't already there. This example from my personal profile is ultimately pretty meaningless, because who cares if Mad Men was a good TV show or not? As a church though, you have years and years of social media posts that are hopefully more impactful than a debate about a TV show. That evergreen content is the perfect type of content to re-enter the newsfeed of people who are connected to some degree to your church or the people who like your church. One of the big advantages that your church has with this tactic that I didn't on my personal profile is the ability to see analytics on your posts. As a starting point, I would open Facebook Insights and scroll through the years of posts and find ones that have a 10% engagement to reach metric. So, if you reach 1000 people, you'll want the post to have at least 100 total likes, comments, and/or shares. If you have a church Facebook page with a ton of posts through the years, you can also export the post data from Insights and sort through everything at glance in 180 day chunks. Or, if you want to, just find a post that you remember having a lively comment thread going. Once you find some ideal posts, just refresh them! 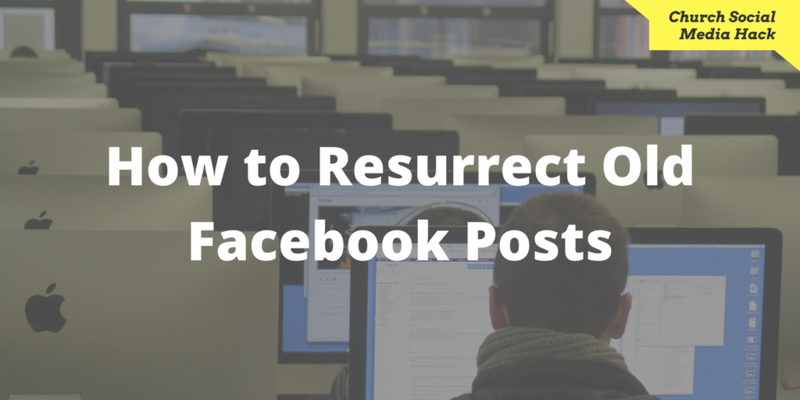 With this refreshing hack, you'll realize that your church's Facebook presence has more content than you realize. In fact, you are more than likely sitting on a gold mine of evergreen content that is ripe for the newsfeed algorithm. You don't have to rely solely on new content that you are creating to reach people in their newsfeeds. You can continue to cultivate a healthy stable of evergreen, engagement friendly posts. If you want to really take it to the next level, you could keep a spreadsheet with the post IDs have the most engaged posts you make for quick access later. Adopting this simple tactic into your social media strategy should hopefully bring you a new, and scaleable stream of engagement. So, what do you think? Have you ever tried to bring a post back to life? If not, give it a try! If it works for your church, send us some screenshots, and we'll add them here to inspire others. 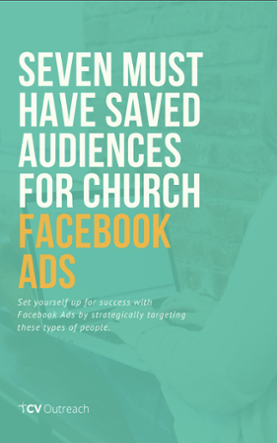 Download our Free Guide for "The 7 Must Have Saved Audiences for Church Facebook Ads"